Here are a couple great Cars books that are perfect for fan of the movie and those who collect! The first is "The Art of Cars" which is fantastic...all of those "Art Of" books are worth getting. I'm slowly trying to get them from each movie. 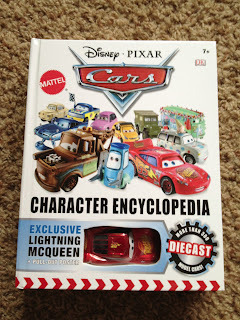 The second is a fun book...it's the "Cars Character Encyclopedia" for Mattel Cars diecasts! It's super fun as each page is loaded with most of the releases from over the past six years including many of the characters (and variations) and details/fun facts about each one. It also comes with an exclusive metallic Lightning Mcqueen and a poster. Works as a great guide & checklist to collecting!